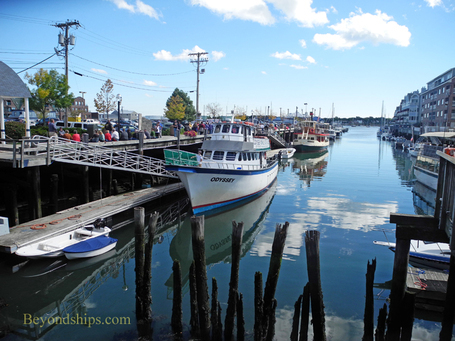 Portland is Maine's second most popular cruise port of call after Bar Harbor. It is a much larger city, however. Approximately, 230,000 people live in the Greater Portland area, which is about one quarter of the entire population of Maine. 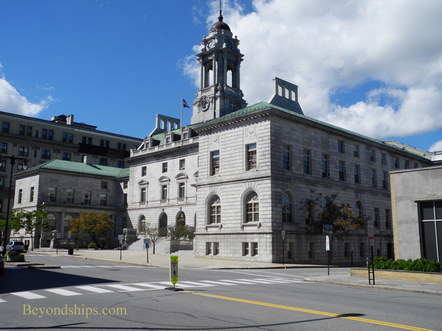 The city is located on a peninsula that juts into Casco Bay. Its waterfront area is level but as you venture inland, the terrain rises into hills. Still, Portland is a very walkable city. 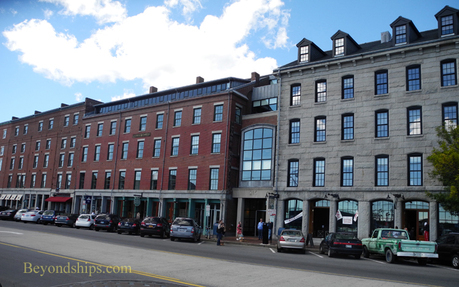 The restaurants and shops of the Old Port District are not far from where the cruise ships dock. Indeed, if you are a moderately strong walker, you can probably walk to most, if not all the attractions in the city center. On a sunny day, it can be quite a pleasant walk. Much of the Portland that we see today dates from the 19th century. There are lovely Victorian homes on the East End bordering the equally nice Eastern Esplanade. In the business district, there are still quite a few brick buildings and relatively little glass and steel buildings. Beware of the brick sidewalks, however, as they can be an uneven surface. The city is clearly undergoing a re-birth. It was once a mighty commercial and industrial center. Many of those businesses have declined or moved elsewhere. But restaurants, art galleries and shops featuring items that you cannot easily find elsewhere are beginning to take their place. But a call in Portland is not just about the city. There are picturesque lighthouses and historic forts in and around the harbor. 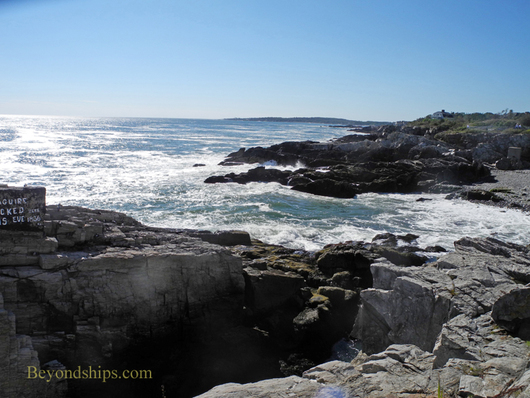 Going further afield, one can see charming seaside towns like Kennebunkport. Above: Buildings in the Old Port District. Below: Along the waterfront in the Old Port. 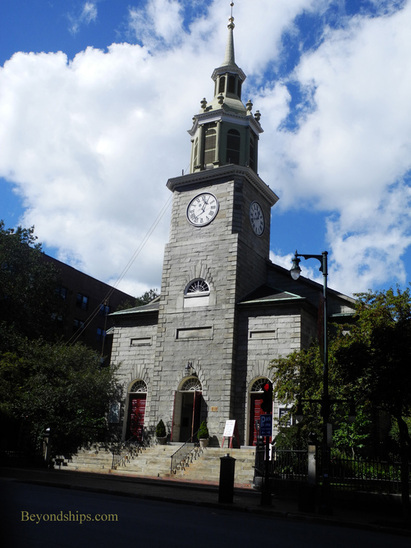 Above: The First Parish Church, built in 1825, is Portland's oldest church and the place where the Maine Constitution was drafted. It has a cannonball that was fired into its predecessor by a British warship during the American Revolution. 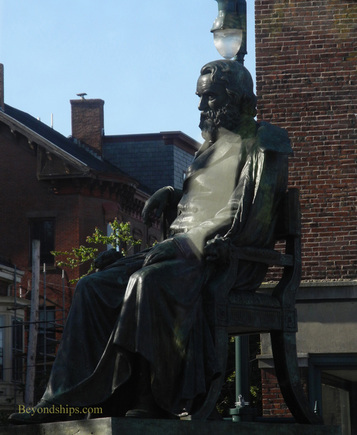 Above: The poet Henry Wadsworth Longfellow grew up in Portland. 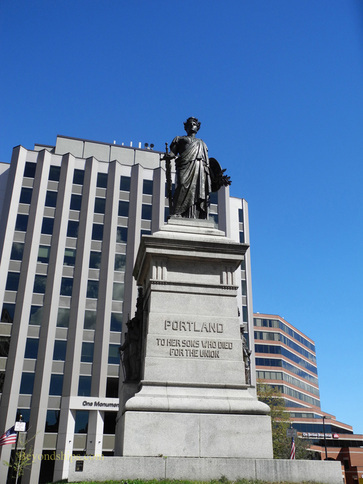 Below: Portland's Civil War Memorial. Above: The remains of Fort Preble, which was built prior to the War of 1812 and used for various military purposes until 1950. 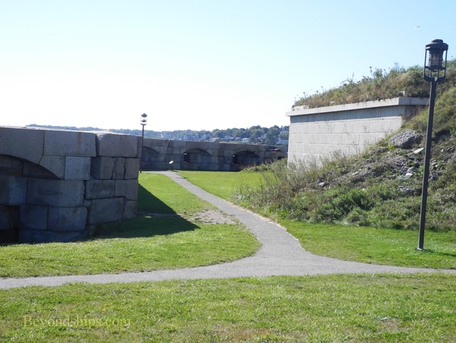 Below: Fort Gorges in Casco Bay was built to defend Portland against Confederate raiders. However, it was not completed until 1865. It is open to the public but only accessible by private boat. The first attempt at a Europe settlement in the area was by an English naval captain Christopher Levett in 1623. However, when he was unable to develop financial support for this venture, it was abandoned. Some ten years later another attempt was made. A village that was primarily focused on fishing and hunting was established. The inhabitants called it Casco but when the Massachusetts Bay Colony took over the area in 1658, the town was renamed Falmouth. That settlement continued to grow until 1673 when the Abenaki people who had sided with the French against the English in King Phillip's War, destroyed Falmouth. In 1678, the settlement was rebuilt and a large fortress constructed but to no avail. In 1690, a force of 400 to 500 French and Indians wiped out the settlement. It stood abandoned until after the end of the war. 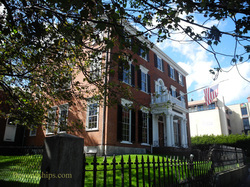 Despite the lack of success in establishing a permanent settlement on Casco Bay another attempt was made in the 1700s. This one came to grief when a Royal Navy ship bombarded the town in 1775 at the beginning of the American Revolution, destroying three quarters of the buildings. After the war, one section of Falmouth emerged as a thriving port and broke away to become an independent city. The name chosen for this town was Portland. Portland became an important port in the early 19th century. 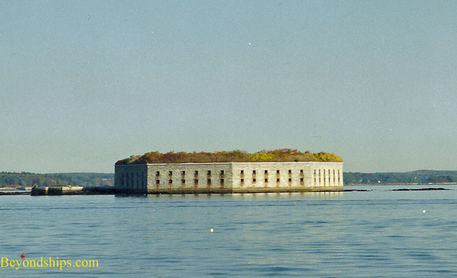 Accordingly, fortresses began to be constructed around Casco Bay to protect the port from raiders. The remains of several of these fortress can be visited today. In 1820, Maine became a state (it had been part of Massachusetts until then) and Portland was selected as the capital. In 1832, it ceded this role to Augusta and focused on being the state's commercial center. Following the completion of the Grand Trunk Railway to Montreal in 1853, Portland became the primary ice-free port for Canadian exports. Portland also became a center for the manufacture of locomotives. The city was once again devastated when, in 1866, Independence Day celebrations set off a fire that destroyed much of the city, leaving thousands homeless. In rebuilding the city, many of the new buildings were made with red bricks and that style of architecture is still prevalent today. During World War II, the port was used as a base for the destroyers that escorted the Atlantic convoys. In addition, Portland was an important ship building city, launching hundreds of Liberty ships. After the war, the Portland area remained an important port for New England. In addition, because of an oil pipeline that had been built from Portland into Canada, Portland became an important oil transhipment center. In the 1970s, downtown Portland was once again devastated. This time the culprits were suburban shopping malls. Downtown stores either closed or moved to the malls, leaving the city center virtually abandoned. However, downtown Portland has once again re-invented itself becoming a center for art, restaurants, finance and tourism. Portland remains Maine's largest city as well as its largest port. 3.6 million tourists visit each year. 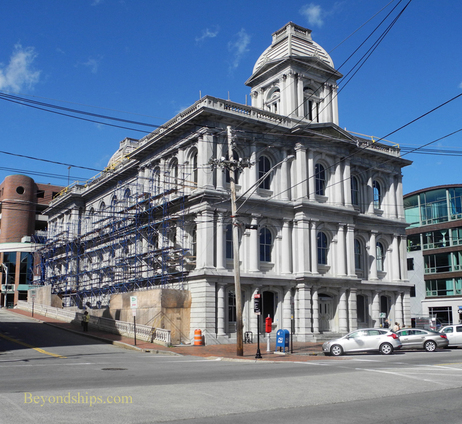 Left: The palatial United States Customs House built in 1868 is an indication of the city's prosperity following the Civil War. 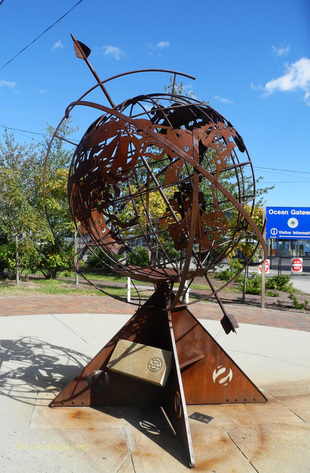 It is now a landmark in the revitalized Old Port area.